A cat was so faithful that the woman could leave her baby with it and go out to tend to other matters. 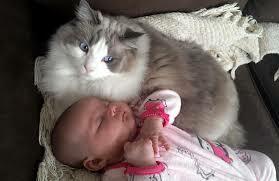 She always returned to find the child soundly asleep with the cat faithfully watching over him. stains all over the bedroom where she left the child and the cat. Shocked, the woman wailed as she began looking for the baby. The he faithful cat emerging from under the bed. It was covered with blood and licking its mouth as it had just finished a delicious meal. The woman went assumed that the cat had devoured her baby. Without much thought she beat the cat with a wood to death. bed lay the body of a snake torn to pieces in what must have been a fierce battle between it & the cat, which was now dead. Reality dawned on her that she has goofed but it was too late for her now to make amends. Before misjudging and tearing people to shreds with harsh words and deeds, evaluate the situation. Little patience can drastically reduce major life long mistakes. Who Are you misjudging right now. Take time to get the whole truth. Be patient with people lest you live to regret ur actions against them.